It is impossible to imagine today's society without the Internet. We could hardly conceive a way of communicating or collaborating remotely without having access to information on the net or without those tools that we take for granted, such as e-mail or the web. But how was Internet born and how did it gain this enormous success? A key player in this story was the world of higher education and research, a domain which has always significantly contributed to the progress and innovation of society. In Italy too, the first digital network deployed throughout the Country was the one serving universities and research centres. GARR network, in operation since 1991, owes its name to the "Gruppo per l'Armonizzazione delle Reti della Ricerca" (group for the harmonisation of research networks), and its creation marked a significant milestone. Before that time, there were many experiments and many different networks connecting individual research institutes, each moving in a different direction, developing technological solutions that didn't speak to each other, with the inevitable result of a great waste of energy and economic resources. The initiative of the then Minister of Scientific and Technological Research was to gather the main players of the Italian digital network services, to integrate the different infrastructures thus creating a single national network: GARR. An infrastructure created to connect with the rest of the world and designed to promote the internationalisation of research. The first link was at an ultra-high speed for those times: 2 Mbps. 20 years later, GARR boasts links at 10 Gbps and is already preparing for 100 Gbps. A non-stop growth that has contributed to the success of innumerable research projects by our academic and scientific community, both nationally and globally. In these 20 years GARR network has been a technological landmark for researchers and has been synonymous with innovation and broad scientific collaboration. The groundbreaking idea that led to the emergence of the Internet is the concept of a network with no central control, but rather composed of different nodes interconnected through pathways which allow data to be rerouted in case of power failure or breakdown of any component. It was the universities that hosted the first four nodes of ARPANET, the network created by the U.S. Department of Defense, which was the precursor of the Internet. It was the scientific world that defined standards and developed the most widely used services like e-mail, mailing lists, news and file transfer services. The TCP/IP protocol was developed in the early 70s at the University of California. Subsequently, in the United States and in Europe, various networks were established to connect universities, research institutes and computing centres, in addition to experimental versions of the first international satellite connections. A turning point for the emergence of large-scale Internet came in 1986, with the birth of the National Science Foundation Network (NSFnet), which provided the first Internet backbone, an information superhighway boasting very high speeds (56 kbps) for the scientific community and American universities. Meanwhile Europe saw the emergence of sophisticated network architectures whose usage would continue to grow. Thanks to its interconnection with the American networks, the Internet - the network of networks - became an unstoppable global communications tool. A decisive contribution came from the European research community: in 1991, CERN researcher Tim Berners-Lee invented the World Wide Web (WWW), with the purpose of exchanging information between research groups working on different experiments. With the creation of an intuitive system for exploring information through hypertext navigation, access to content on the network became available to everyone and not just technicians. Italy has always played a leading role at the international level in the field of computer networks. Originally, as in other countries, the situation was rather fragmented, and already by the end of the 70s there were different networks developed in the research sector. CNR network, RPCnet, became operational in 1978; INFNet, the network for nuclear physics was born in 1979; and in 1984 a project was presented for the National University Network (RNU) that would link all universities belonging to the various Computing Consortia (CILEA, CINECA, CSATA). Each network spoke a different language due to the use of different protocols, which made any kind of collaboration very difficult. The first intercontinental connections between different networks were made thanks to satellite communications, and date back to 1977 with the United Kingdom and Norway. Italy was the third European country to connect in 1986 a network node to Arpanet thanks to the National Center for Electronic Computing (CNUCE), a CNR institute based in Pisa that was able to establish a connection via an agreement signed with Italcable and Telespazio. A pan-European network began to emerge in 1984; the European Academic and Research Network (EARN) was the continental version of the US inter-university network BITNET, which promoted the use of the network in the university and research field and stimulated the establishment of a homogeneous community of users. Italy was the first country to have a link with BITNET. The experience of the first networks linking different organisations soon demonstrated that individual networks were not a viable option, being too expensive and insufficient to ensure the interdisciplinary exchange needed for research. It was therefore necessary to share resources and to unify experiments. Faced with the increasing use of digital networks for information exchange, researchers soon realised how the existence of increasingly fast, reliable, and, above all, interoperable channels would become a very important requirement for their work. Similarly, from an economic standpoint it was understood that multiplying resources and energies for different networks for each field of application or private interest was not the right path to follow. In this context, the European Commission began to define longer-term objectives and launched the EUREKA program to support innovation, research and development projects in all technology sectors. Within this program, the COSINE (Cooperation for Open Systems Interconnection in Europe) project was launched with the aim of encouraging cooperation among researchers in Europe and promoting the development of open networks and the use of a non-proprietary protocol such as OSI. COSINE (1985-1993), in particular, aimed at creating a single network within the European landscape, and to do this it was necessary for each country to initiate a process of harmonisation of existing networks at the national level. Thanks to this European push, the then Minister of Scientific Research, Granelli, and his successor Antonio Ruberti, together with the delegate for the EUREKA projects, Orio Carlini, began to lay the foundations for the Italian participation in the European common network by summoning the key players of the national computer networks, who began to work to interact with each other. Thus, in 1986, at one of the preliminary meetings, the word GARR (meaning Group for the Harmonisation of Research Networks), was first used. A formal request was made to Minister Ruberti for the establishment of this working group by the 6 founding bodies: CNR, INFN, ENEA, CILEA, CINECA, Tecnopolis CSATA. The request was accepted and GARR, born as a spontaneous working group, was formalised as a Ministerial Commission with a Decree on March 11, 1988. The commission, chaired by Prof. Orio Carlini, worked immediately on the project of a national network infrastructure to be put in place with the funds for infrastructure investments that the National Budget Law of that year had assigned to the Minister of Scientific Research (a total of 50 billion lire were earmarked for computing and network projects). In addition to creating a single network, GARR also pledged to expand and integrate network services, streamline costs and harmonise development policies. Meanwhile, at the international level, GARR was carrying out the important work of coordinating the European networks and promoting scientific collaboration. The new unified network saw the beginning of a season of great technological innovation in the networking sector, the result of a constant commitment and a great spirit of collaboration among the various players in the field. The project for the creation of the national research network was presented to the Ministry in 1989; once approved, it received a grant of 5 billion lire from the chapter on research infrastructure of the 1988 National Budget Law. The total cost of the project was more than 8 billion, and the remaining 3 were invested by the six member organisations, who signed an agreement on March 2 1989, providing for a three-year term and the establishment of a Network Management Committee chaired by Antonio Cantore, director of CILEA. The first phase of the project called for the establishment of the network backbone that interconnected 7 main nodes: Milan (CILEA), Bologna (CINECA and the ENEA and INFN-CNAF pole), Pisa (CNR-CNUCE), Rome (INFN), Frascati ENEA and INFN) and Bari (CSATA). The speed of the connections between these sites was very high for the time at 2 Mbps. Subsequently, hundreds of other research institutes and universities were linked with variable speeds from 64 kbps to 2 Mbps. The network also had links with international research networks and with CERN in Geneva. The project was completed very fast, so that in early November 1990 the first tests were carried out and the network became fully operational in 1991. Nevertheless, the work was not easy because, with different protocols, each network was speaking its own language, with each research group considering their own choice was the best. The approach used by GARR network was not to impose a protocol on others but rather to allow them to co-exist. It was the natural evolution of the network to determine the success of the TCP/IP protocol that is still in use today. The network was recognised internationally as one of the most advanced in terms of design and performance and was created to adapt easily to future developments. From the beginning, there were specific working groups within GARR for the various network aspects: one for the network infrastructure, one for e-mail and one for each of the different network protocols. These groups included the most important experts in the field, those who a network historian such as Giorgio Giunchi called "the via Panisperna Group of the Italian Internet". GARR network grew rapidly, and subsequent years saw technological developments that led to ever higher speeds. GARR-2 became active in 1994, reaching speeds up to 34 Mbps by 1996, while 1998 saw the birth of GARR-B (Broadband), which once completed would reach 155 Mbps. In the 90s, the design and management of the network were a cooperative effort involving all institutions; among these, INFN-CNAF was particularly active. In more recent years, starting in 2002, the order of magnitude was the Gig. In fact the GARR-G (Giganet) network includes connections up to 10 Gbps. The future is here and the new network for universities and research is GARR-X. A network almost entirely made up of optic fibre that when completed, will reach speeds of up to 100 Gbps. It is the first Next Generation Network in Italy, born in January 2011 with new access links for hundreds of sites. 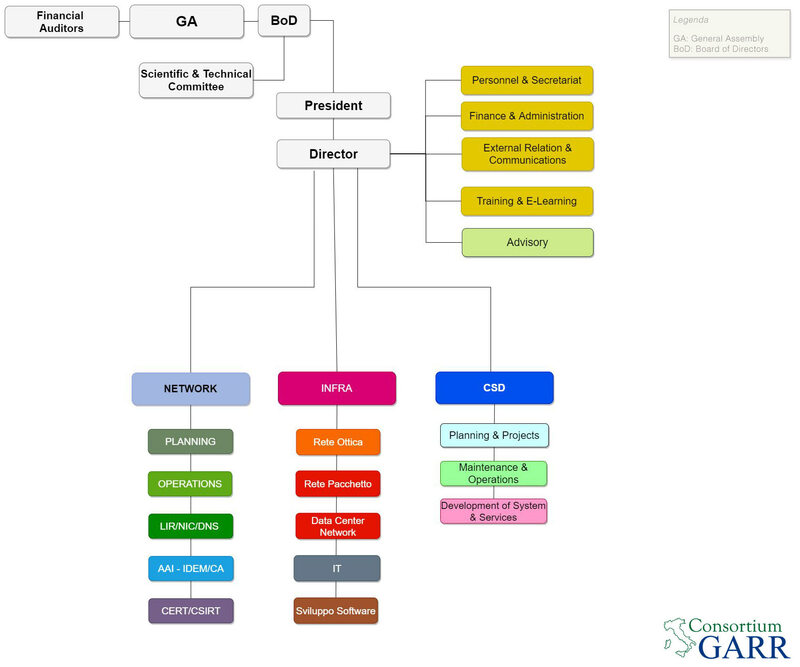 The brief chronological summary presented here leaves out many aspects that have marked the history of GARR network, such as technological innovation and the expansion of the portfolio of advanced services, which over the years have enriched GARR offering for the national scientific community. However, even if we only consider its evolution in terms of connection speeds, we realise how the development of the network for research has been constant, in keeping pace with technological developments and the needs of a consistently innovative community. In 20 years the bandwidth capacity has grown by more than 5.000 times and the number of sites connected has gone from the initial 7 to over 500 centres throughout the Country. The community of connected organisations has also grown, in accordance with a concept already supported by Minister Ruberti: not just universities and research labs but also hospitals, academies, music schools, museums, libraries and other cultural institutions. On the management front, the group born spontaneously in 1986 changed its institutional form several times, without however losing sight of the goal and the original spirit of contributing to innovation and supporting collaboration in the academic and scientific world. Over the years, the growing popularity of the network has led to a shift from a field of predominantly technological experimentation to a true service for the scientific and academic community. The transformations in the organisational structure have therefore taken account of that change. In December 1990, alongside the GARR Commission founded in 1988, the ministry (MURST) established a Commission for Scientific Computing to promote the development of scientific computing, increase the potential of the network infrastructure and optimise available financial resources. These two commissions came together in April 1993 as the Commission for Networks and Scientific Computing, which in January 1994 created an advisory body for GARR network which could function as an operational point of reference for the national research network. The management of GARR network was thus transferred to the Organismo Tecnico Scientifico (OTS), with Orio Carlini nominated as its president. In 1998 the GARR-B network became operational; this was a true quantum leap for its increased coverage throughout the territory. The new network, thanks in part to special funds for certain areas of southern Italy, was able to bring network infrastructures to those areas of Italy where they were most lacking. The leadership of the project was assigned to INFN, that had previously signed a Framework Agreement with the Ministry of University and Research. The leadership was however temporary because the project had already planned the creation of a Consortium between research institutions and universities, which in the future would be tasked with planning and guiding network developments. The path that led to the birth of Consortium GARR was not easy, but on November 13, 2002 the charter was finally signed. The signatories, under the patronage of the Ministry of Education, University and Research, were the representatives of the founding bodies: CNR, ENEA, INFN and the CRUI Foundation representing all Italian universities. The first President of Consortium GARR was Angelo Scribano. The title of GARR first conference, organised in 2005, is emblematic in describing the status of the network and its evolution: La rete daPERtutto ("the network everywhere"), in other words extremely pervasive throughout the territory and used by many different disciplines in the most diverse applications. Today, Information Technology is no longer an exclusive tool of some sectors, thanks to the technological innovations that have had a strong impact on the daily lives of each of us and made digital infrastructures accessible to everyone. The reason for this growth is also tied to its international character, always in step with global changes and innovations in the telecommunications sector. GARR was born in strong synergy with other European research networks, participating as founder in the organisations that have written the history of European networking: from RARE, the Association of European research networks, to RIPE, born for sharing experiences and technical know-how of those who manage IP networks; from DANTE, the organisation that manages the Pan-European network GÉANT, to TERENA, the association of European research networks formed by the merger of RARE and EARN. The international research connections, together with the provision of services available regardless of users’ geographical location, are undoubtedly an added value for GARR network, determining its distinctive character compared to other network operators. Students, teachers, and researchers in Italy can benefit from ultra-high speed connections with the rest of the world and can exploit the great potential that networks offer to carry out large-scale research projects and establish partnerships with prestigious institutions and organisations. In the European landscape, the growth of digital technologies has been steadily increasing in terms of performance: since the launch of the COSINE project for the creation of a single network, the pan-European network infrastructure has seen numerous upgrades. Initially the IXI network (1987), then Europanet (1993), TEN-34 (1996), TEN-155 (1998) and finally the current GÉANT (the version launched in 2009 is the third after those of 2000 and 2004). Anticipating the increase in interdisciplinary collaborations and data flow over the coming years, GÉANT has already conducted the first tests to bring the speed of backbone connections to 100 Gbps. Thus it continues to anticipate the requests of its users. An illustration of the most significant stages of Internet and Web history: from the birth of Arpanet in 1969, to the first e-mail, to Tim Berners-Lee's invention at CERN in 1991, up to the birth of social networks and the latest technological innovations. A story that has seen GARR research network as a key player who has often been able to anticipate the needs of its own user community. Click here to download all images in one file (zip, 6,9 MB). The 20th anniversary of GARR network was celebrated on October 24, 2011, at the headquarters of the Ministry of Education, University and Research in JF Kennedy Square. The event was an opportunity to reflect on how research networks and their users have changed the way they are doing science over the years, and to illustrate the benefits and opportunities that global interconnected research infrastructures offer to the scientific and academic community in Italy. During the ceremony, prizes were given in memory of Prof. Orio Carlini and of Prof. Antonio Ruberti, which GARR has earmarked for proposals or original work presented by young researchers on issues related to Future Internet and Next Generation Networks. The new GARR-X network was presented on November 29, 2012 in Rome: 8.500 km of optic fibre for the first Next Generation Network nationwide, serving more than 2,5 million researchers, teachers and students. The new Education and Research network was officially presented by Consortium GARR at the headquarters of the Ministry of Education, University and Research, in the presence of Minister Francesco Profumo.